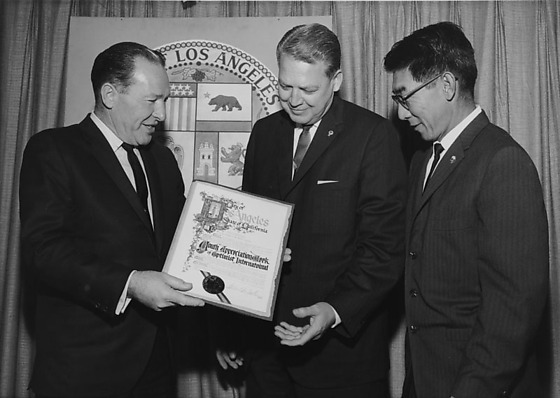 Los Angeles Mayor Sam Yorty presents a proclamation for the "Youth Appreciation Week of Optimist International" to Optimist officers and president of the Japanese American Optimist Club in the Mayor's office at Los Angeles City Hall, Los Angeles, California, September 1963. Caucasian man in a dark suit, Yorty, holds proclamation in hands as a tall Caucasian man in suit prepares to receive it and a Japanese man in suit and eyeglasses looks on at right. Los Angeles City emblem in background. Typed on original envelope: Youth Appreciation Week.